The new ITC Web Interface brings web control of the ITC-3 Traffic Controller to your office or in the field. You can connect to the interface with a web browser. The remote control provides extended capabilities to view and modify parameters in an easy and intuitive way. 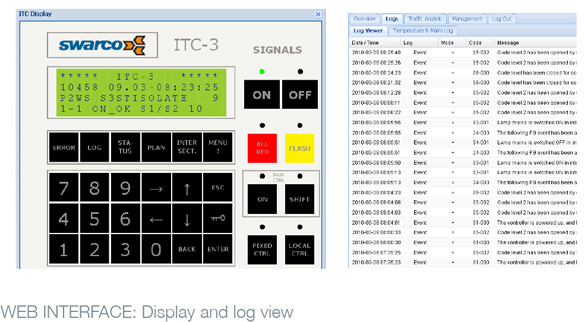 These powerful tools provided by the front panel of the ITC-3 Controller are also available through the ITC Web Interface enabling flexible and better management of your intersections. Additional tools compared to the physical front panel of the ITC-3 traffic controller. Displays the current overall status for the controller as well as information about the intersection(s) controlled. 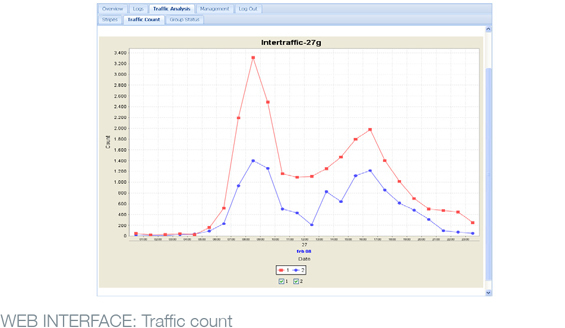 The user may change the current traffic plan, traffic situation and view the error log. Provides a dialog box for defining the number of vehicle counters and the start/end of the counting interval. The results are displayed with user defined resolution. Displays diagrams showing the colour schemes of user selectable signal groups within a specified interval. Provides detailed log entries with descriptions divided on the basis of time, mode, code and a message describing the log entry. Displays a live image of the selected intersection. Emulates the functions of the controller’s front panel. Provides a textual user interface, coupled to the programmable functions of the controller. Enables the creation of users and editing of their rights to specific tasks and services in the ITC-3 Web Interface. 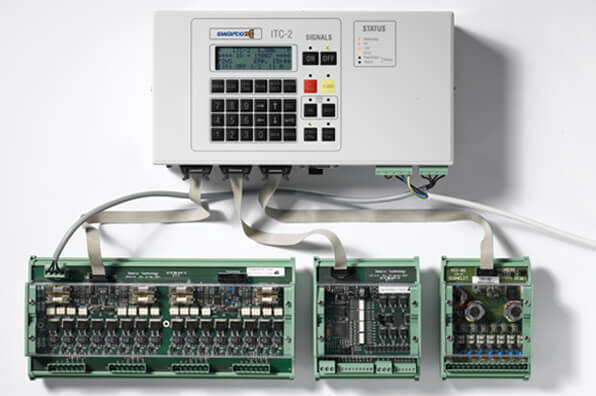 Provides server specific information and functionality to set up basic parameters of the ITC-3 Controller. Provides an upload feature for new ITC-PC configuration files as well as the possibility to download the current configuration. Allows the user to edit his/her password. Supported browsers: Internet Explorer 6 or higher, Mozilla/Firefox 2.0 or higher. ITC-2 has been designed and developed according to European and inter-national standards and is suitable for all climatic conditions. It is modular in design and can be configured for all types of intersections. Using TCP/IP or 3G modem it can be directly connected to many control and monitoring systems. 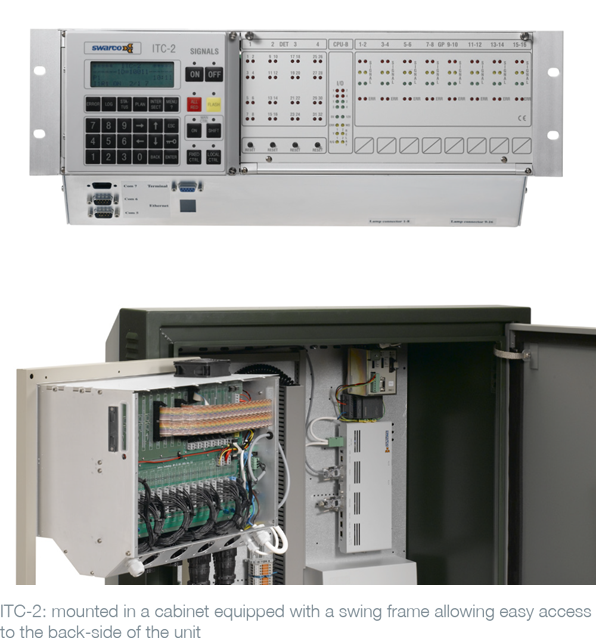 The controller can be delivered in three different sizes depending on the number of signal groups required - the 3U rack with 16 signal groups and 32 detectors, 32 and 64 signal groups and 80 detectors. SWARCO TECHNOLOGY develops and markets traffic and motorway controllers as well as communication equipment for traffic management systems. Thousands of SWARCO products have been installed and are now in use in different applications in many countries. ITC-2 Mini Traffic Controller is a low-cost version of the ITC-2 Traffic Controller, providing the same modular design and flexibility of the ITC-2. This mini-version is a cost-effective choice for small intersections and pedestrian crossings. It has four signal groups and can be installed on a DIN-rail in a small cabinet. The controller has been developed according to European and inter-national standards.